When stylist Mark Bustos isn't cutting the hair of fashion designers and real estate moguls, he's traveling around giving free haircuts to the homeless. Bustos works at Three Squares Studio in the New York City neighborhood of Chelsea, where prices for his services start at $150 and can run as high as $800 for certain straightening or color treatments. 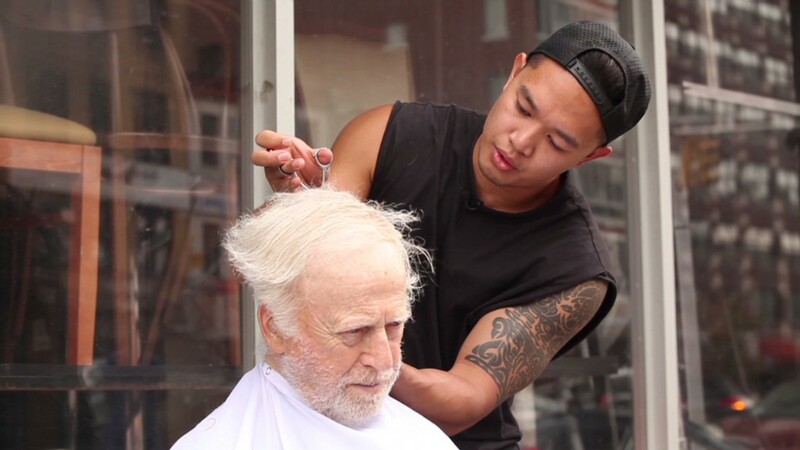 On his days off, stylist Mark Bustos gives free haircuts to the homeless. Here are some of the transformations. But whenever he can, he packs up his scissors, combs, styling products and rechargeable buzzer and goes out on the streets of New York to give free haircuts to homeless men and women. On Sunday he started out on the Bowery in lower Manhattan where he found "Red," an older man whose nickname comes from the bright red gloves he wears in the winter. Red is a fixture in the area, always sitting on the same wooden stool. After the two chatted a bit, Red sat down on his stool and Bustos got to work. A line of other men formed as Bustos whittled Red's wispy, white hair and trimmed his eyebrows. When Bustos finished, Red smiled, dragged his wooden stool back to its original spot and began feeding stale crusts of bread to a flock of pigeons. Red said he doesn't care about his looks anymore, but the haircuts make him feel "cleaner." While most of the people on the street who receive haircuts are homeless, not everyone is, and Bustos isn't sure about the situations of some, like Red. 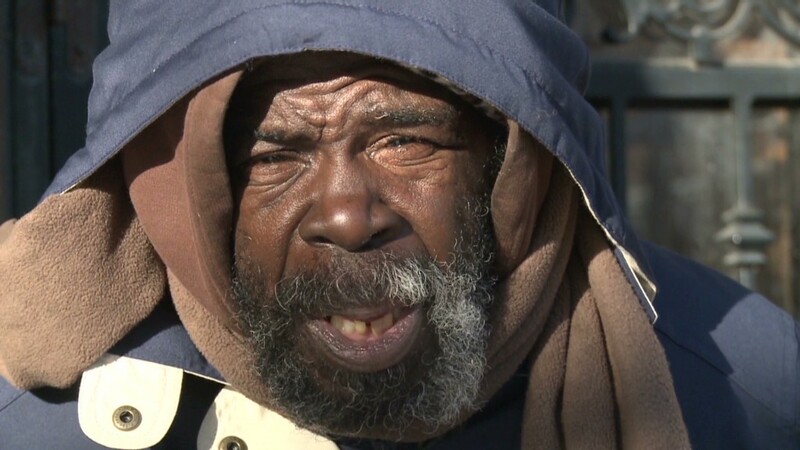 Next up was 56-year-old Ray, who has been homeless for eight years as a result of a drug addiction. Ray said he was seeing his 11-year-old daughter that evening, and wanted to look put together for the visit. He carried over a milk crate to sit on, and after Bustos finished buzzing his head and grooming his goatee, Ray gave high fives to his friends. He then gave Bustos a big hug, calling him his "angel." "When someone comes along and gives you something you never get, it's just nice," said Ray. "It makes me wanna cry." Third in line was James. After getting his hair shaved, he said he finally felt confident enough to go out and apply for jobs. Passersby stopped to ask questions, snap pictures and commend Bustos. One person was a barber who said he'd be interested in helping the homeless, too. And that's exactly why Bustos sets up in such public spaces -- to inspire people to use their own passions to help those in need. For Bustos, now 30, it all started in 2012. While visiting family in the Philippines, he decided to host an event where he gave free haircuts to needy children at a local barbershop. "It made such a strong positive impact on me that I decided to bring it back home to NYC," said Bustos. Since then, Bustos estimates he's cut the hair of more than 50 homeless people -- not just in New York, but also in places like Costa Rica, Jamaica and Los Angeles. Most homeless people prefer simple buzz cuts because they don't know when they'll be able to get a haircut again and are often trying to get jobs. A more edgy cut won't necessarily help the job search -- and would be much harder to maintain. Bustos looks for homeless people living on the streets rather than in shelters, because they often need an extra "jump start." People in shelters, he says, have at least taken the initial step of getting a roof over their heads. "I approach individuals on the street or parks and tell them the purpose of what I do," he says. "Cutting their hair becomes a lot like a therapy session and not just a haircut." The first homeless person in New York that he gave a haircut to looked in the mirror after Bustos was finished and said, "Do you know anyone who is hiring?" Other people are so shocked after looking in the mirror they can't even speak. "I make a point to ask every person how the haircut makes them feel, and 90% say it gives them more confidence," Bustos said. Another time he found a man in Long Beach, Calif., sitting under a tree. The man told Bustos he had just gotten out of prison, where he had spent 10 years. "I asked him what he was sent to prison for, and he said 'kidnapping and robbery.' Then there was just this awkward silence. It was the longest 10 seconds of my life, because what do you say to that?" said Bustos. "But everyone deserves a second chance." He sees many of the same people over and over again, and hasn't heard any success stories yet. But that doesn't stop him from being optimistic. "A lot of them are still on the streets, but I have hope for them -- like James, I have hope that James will find a job tomorrow," he said.